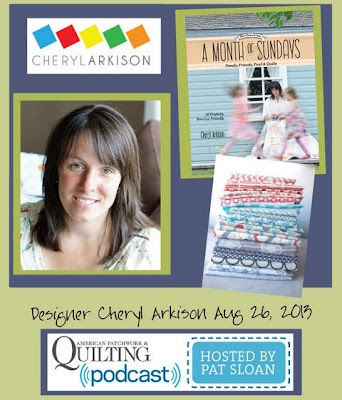 This afternoon I am quite excited to join Pat Sloan on her American Patchwork and Quilting radio show! Pat is a force in the industry and such a joy to talk to. I only wish we would have our chat over an afternoon walk. Join us. Tune in online live or download the podcast later. The show starts at 4 pm Eastern. We'll be talking A Month of Sundays, low volume fabrics, and a lot more. I will listen to the podcast. I read your book through today, I loved it! I also really love the quilts, they are fresh, modern, straightforward, and nicely explained too.